Ford says it could incorporate plug-in hybrid technology into its new Mondeo, shown, a sister model of the U.S. market Fusion. LONDON -- Ford Motor may introduce plug-in hybrid models in Europe as rival Volkswagen Group expands its offerings of such cars. Ford already sells plug-in hybrid versions of its Fusion midsize sedan and C-Max compact minivan in the United States, but the company hasn't launched plug-ins in Europe because of low demand. Ford is "actively considering" a plug-in hybrid for Europe, Uli Koesters, the company's vehicle line director for large cars in Europe, told Automotive News Europe. 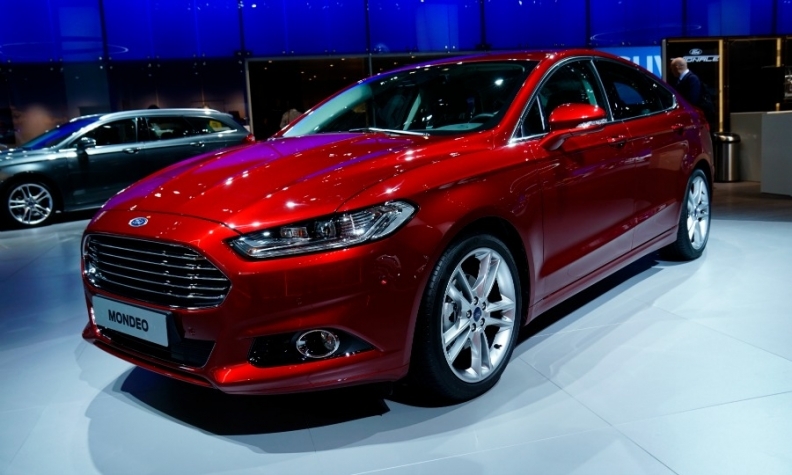 Koesters said Ford is able to incorporate the technology into its new Mondeo, a sister model of the U.S. market Fusion. Volkswagen has just launched a plug-in variant of its Golf compact hatchback in Europe and will introduce a plug-in variant of its new Passat midsize sedan next year. Koesters said Ford could “quickly respond” with a plug-in hybrid car if the market demanded it, but said that wasn’t the case now. The Mitsubishi Outlander was the top-selling plug-in hybrid in Europe in the first half with sales of 8,953 units, according to JATO Dynamics market researchers. Toyota sold 4,265 Prius cars with hybrid and plug-in powertrains. Volvo sold 3,233 units of its V60 plug-in hybrid.